IN PICTURE: ZOE FOO (LEFT) IN ACTION AGAINST OOI KAH YAN (RIGHT) DUIRNG THE REDTONE KL JUNIOR OPEN QUARTER-FINALS. 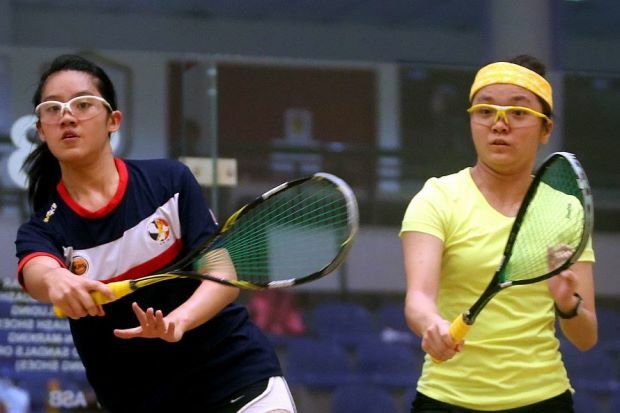 Zoe Foo showed her mean side to dispose of Ooi Kah Yan in the quarter-finals of the Under-19 category at the Redtone KL Junior Open squash championships. The 18-year-old Zoe was under pressure to deliver results with her place in the World Team Junior Championship next July under threat. And the world No. 107 duly passed the test with flying colours after beating the 16-year-old Kah Yan 11-2, 11-6, 9-11, 11-5 at the National Squash Centre in Bukit Jalil yesterday. Zoe, who has four Asian Junior Cham­pionships runners-up medals, attributed the win to a more aggressive approach in her game. “I’ve always been a bit timid on court and playing aggressive squash was never really my thing,” said Zoe. “I guess that’s what I have been lacking for a while … which is why I always struggled to get past the tougher Egyptian girls. “But I played a more attacking game today … adding more shots to my usually defensive style and I was definitely mean on court. Zoe, who is aiming to nail the title in the absence of world No. 51 S. Sivasangari, takes on Singapore’s Au Yeong Wai Yhann in the semi-finals. The joint fifth-eighth seeded Wai Yhann upset the form book by packing off second seed Lynette Vai of Papua New Guinea 11-9, 6-11, 6-11, 11-6, 11-9. The other semi-final will be between top seed Andrea Lee and Penang’s Nur Aliah Izzati. In the Under-17 category, two Malaysians – Chan Yiwen and Lee Jia Wei – made the semi-finals. The Under-15 title is already in the bag with top seed Wong Heng Wai and second seed Jessica Keng taking on Malaysian opponents. In the boys’ Under-19 category, top seed Darren Rahul Pragasam thumped Australia’s Joseph Lachlan 12-10, 11-0, 11-5 to set up a semi-final clash with compatriot Mohd Ezzri Nazri.